Thursday, May 20-- Introduction to the course. Why Study History? Poem: Walt Whitman, Thou Mother with Thy Equal Brood. (1872) The Age of Discovery. The Conquest. Document: Daily Lives. Documentary: The Columbian Exchange. 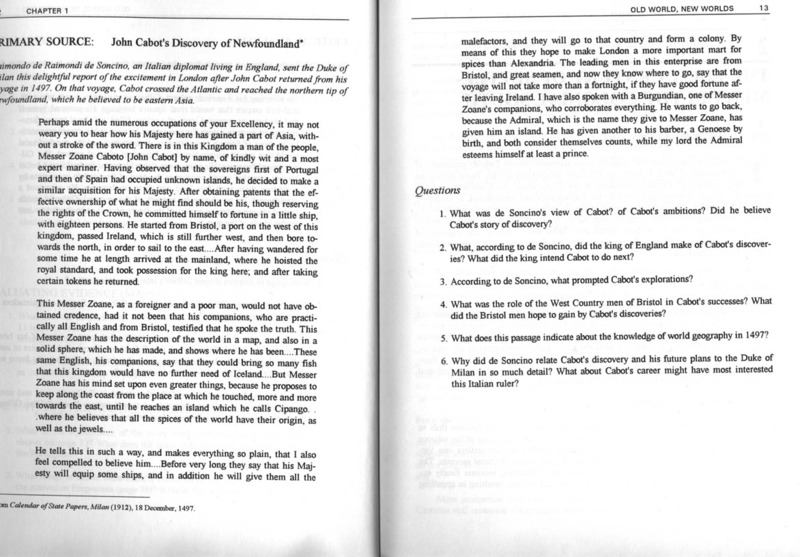 Document: John Cabot's Discovery of New Foundland. Additional Internet Resources on the Conquest. Tuesday, May 25-- The French Come to the New World. Movie: Black Robe. (1991) A New English Colony--The Founding of Virginia. Additional Virginia Resources on the Internet. Tuesday, June 1--The French & Indian War. PAPER ONE DUE. Tuesday Thursday, June 3-- Documentary on The Last of the Mohicans. The Road to Revolution. The Declaration of Independence. Additional Revolution Resources on the Internet. Tuesday, June 8-- Documentary: Africans in America. Episode II: Revolution, 1750-1805. The War in New Jersey. Additional Revolution Resources on the Internet. Thursday, June 10-- Patriots v. Tories. Movie: Mary Silliman's War. QUIZ TWO. 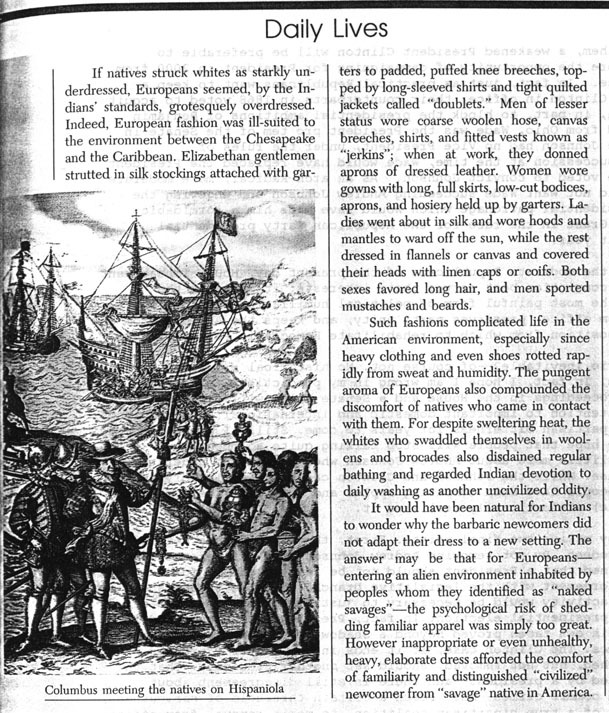 (On the American Revolution) Additional Revolution Resources on the Internet. Tuesday, June 15--PAPER TWO DUE. Building a Republic: A new Constitution. Africans in America. Episode III: Brotherly Love, 1791-1831. Additional Constitution Resources on the Internet. Thursday, June 17--The Election of 1800. Thomas Jefferson: A Film by Ken Burns, Episode I. Excerpts from Thomas Jefferson's Autobiography and the Notes on the State of Virginia. Thomas Jefferson's Views on Women. Additional Thomas Jefferson Resources on the Internet. Tuesday, June 22--PAPER THREE DUE. More about the Constitution. Thomas Jefferson: A Film by Ken Burns, Episode II. Additional Thomas Jefferson Resources on the Internet. Thursday, June 24--More Trouble with Britain & France. Africans in America: Episode I. Slavery: The Peculiar Institution. Additional Internet Resources About Slavery. Tuesday, June 29--Slavery & Western Expansion. Africans in America: Episode IV. Additional Internet Resources About Slavery. Thursday, July 1--FINAL ESSAY DUE. Brother Against Brother: The Civil War. Documentary: The Civil War: Episode I. Additional Civil War Resources on the Internet.